The 7th Century writer, Tírechán, wrote that Inishpatrick off Skerries, was the ﬁrst place on which Saint Patrick set foot on his return to Ireland as a missionary. It was near here, somewhere close to the mouth of the Delvin River, that Saint Patrick converted his successor Benignus, regarded as the ﬁrst native Irishman to become a bishop. Legend has it that when the saint arrived on the island he was accompanied by a goat which provided milk. From this island St. Patrick would come to the mainland to convert the people. 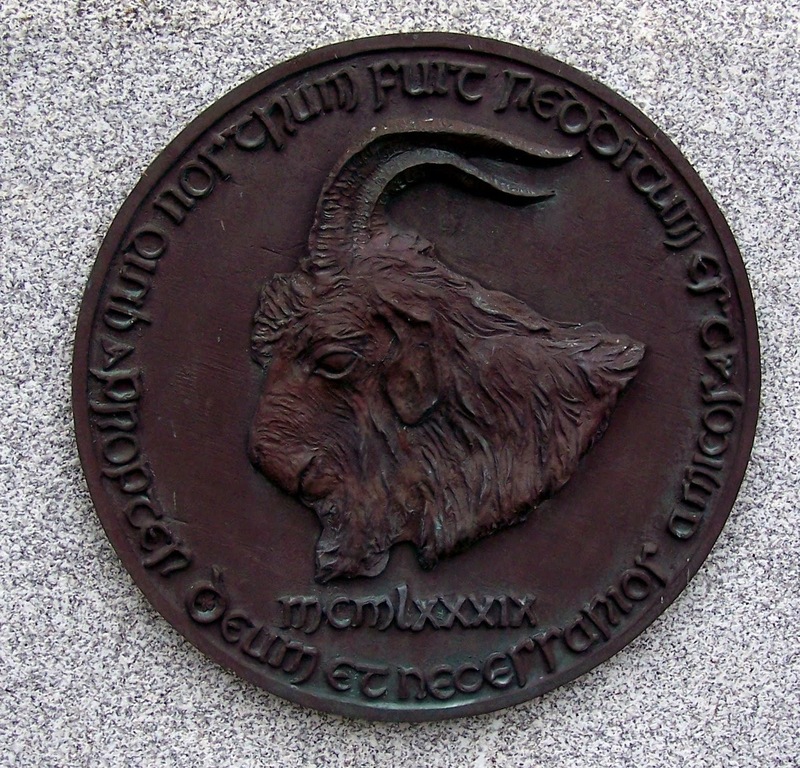 While the saint was ashore on a missionary trip the people of Skerries visited the island and stole his goat. They killed, cooked and feasted on it. When St. Patrick came back to the island he found his goat missing. This made him very angry and in two giant strides he reached the mainland. The ﬁrst step took him to the back of Colt Island, the second to Red Island where he confronted the people of Skerries. They tried to deny having seen his goat but found the beast cried out from their bellies. When they told the saint the truth about his goat their voices returned. In 1989, the 50th anniversary of the building, it was decided to commission a bronze goat's head and mount it on the wall hus giving St. Patrick back his goat. 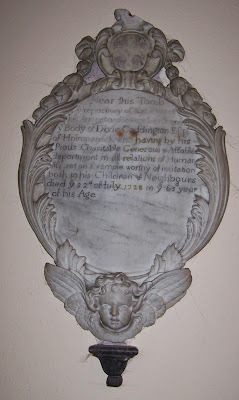 The inscription around the plaque reads "quid nostrum fuit reddituum est propter deum et necessarios amicos mcmlxxxix" which roughly translates as "that which was ours is restored on account of God and necessary friendship 1989". 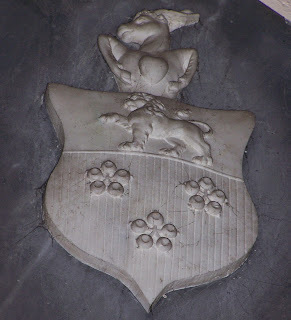 A visit to the Church of Ireland at Holmpatrick sees some interesting heraldry. The quartered arms of Wood impaling the arms of Taylor. 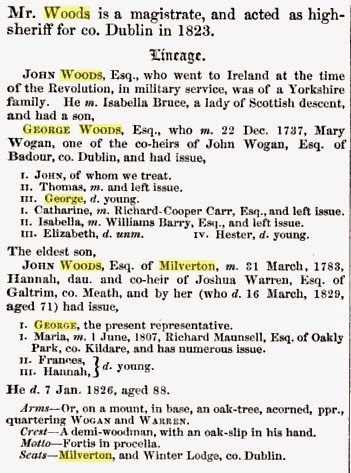 Woods: Or on a mount in base an oak-tree acorned proper. 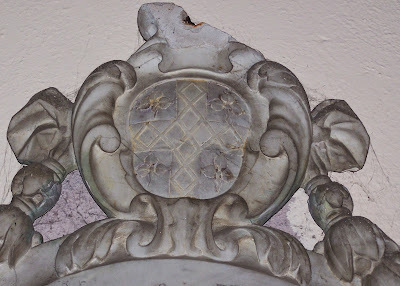 Taylor: Ermine on a chief gules a fleur-de-lis between two boar's heads couped and erect or. 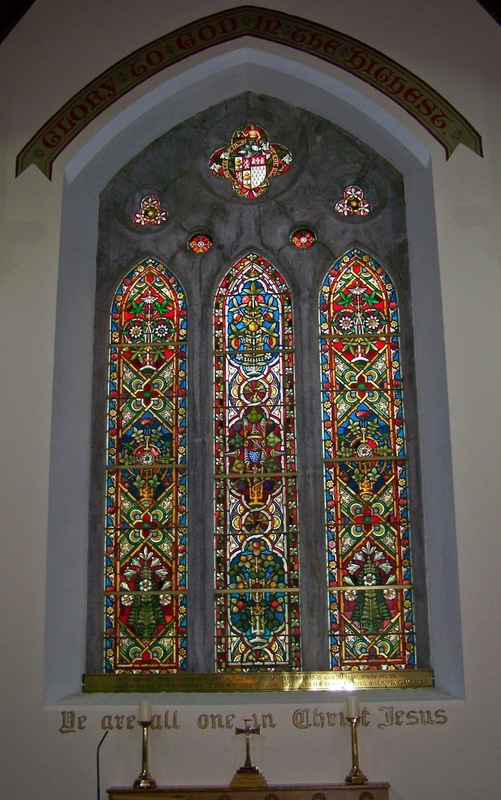 The east window carries the impaled arms of Woods (quartered) with Taylor for Hans Hamilton Woods and his wife Louisa Taylor. 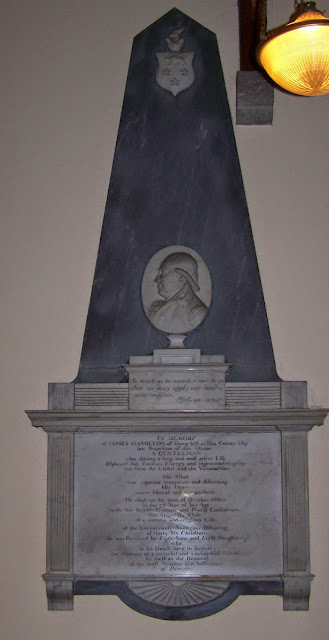 He was the son of George Woods and Sarah Hamilton, daughter of Hans Hamilton of Sheephill. 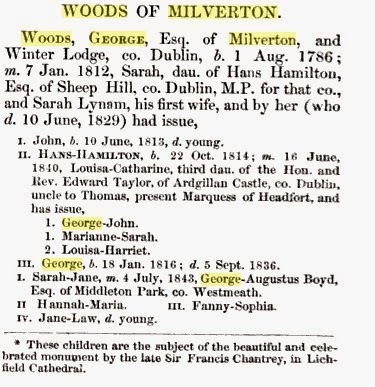 As you'll see below the names of Wogan, Warren and Bruce occur in the Woods ancestry. 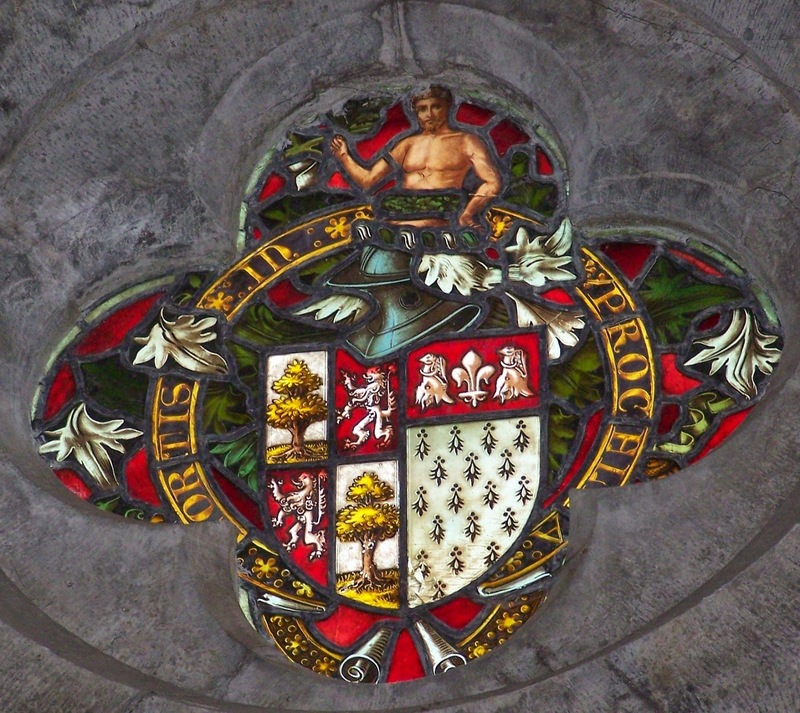 The quartered arms of Woods, Wogan and Warren were listed. It is not immediately obvious to which family the red lion rampant is attributed. Variations of the arms of Bruce and Warren and even Woods carry a lion rampant. 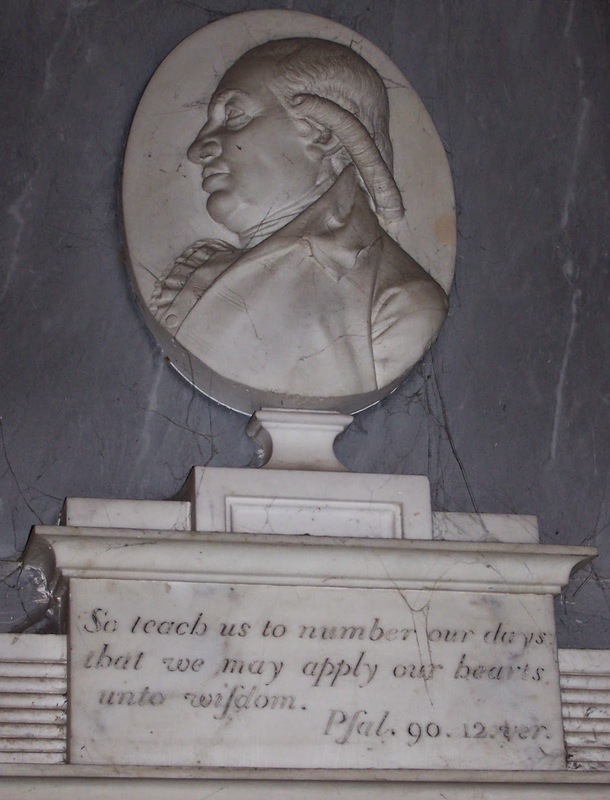 The monument to James Hamilton of Sheep Hill who died in 1800 in the 73rd year of his age. 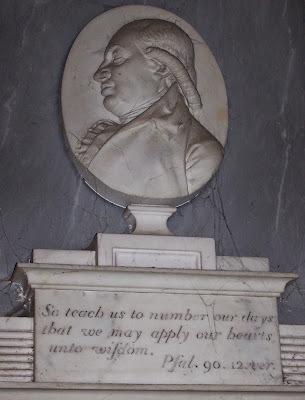 He was survived by eight sons and eight daughters. The monument to Dixie Coddington of Holmpatrick who died 1728 in the 63rd year of his age. The arms of Coddington - Gules a cross or, fretty azure between four trefoils slipped of the second.